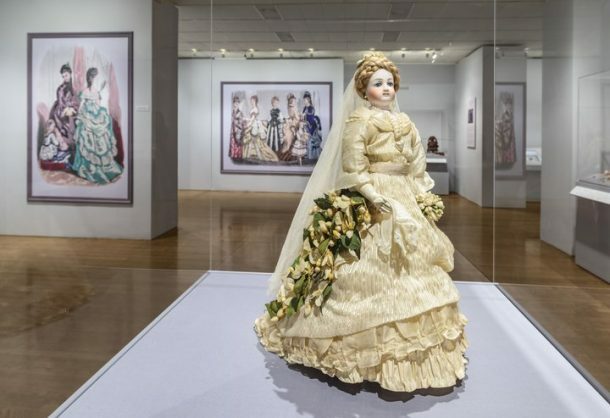 Little Ladies: Victorian Fashion Dolls and the Feminine Ideal, on view at the Philadelphia Museum of Art until March, is a curious show that seems to be trying to navigate between two opposing poles. 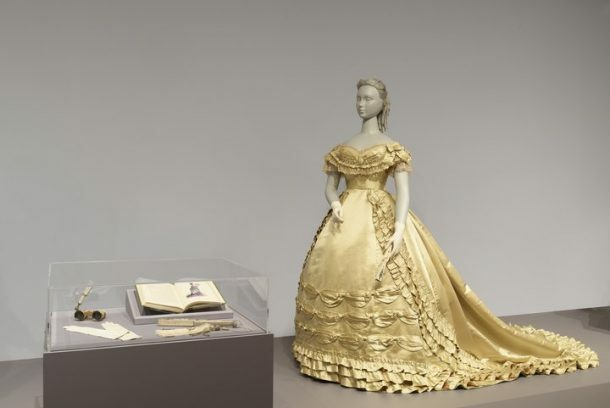 On the one hand, Little Ladies is clearly meant to delight, drawing on the museum’s permanent collection to showcase the incredible range of fashions for dolls that became popular during the Victorian era in the United States. And the other half of the equation is Victorian fashion dolls as societal programming for young girls, which is nodded to both in terms of what is placed on display and the way the wall texts are structured. Every item a proper lady was expected to have in her wardrobe, from dresses and coats to gloves and handkerchiefs, was reproduced in miniature for young girls’ dolls, both to entertain them and to instill in their minds a sense of the sartorial expectations they would face as adults. But because I’m rarely satisfied with museum shows as simple collections of beautiful objects, regardless of how beautiful the objects are, I found Little Ladies lacking when it came to a more rigorous level of analysis of why these objects were so vital for viewers to consider in the 21st century. This isn’t to say that these exquisite clothes that were meant for porcelain dolls weren’t a pure delight for fans of fashion. The care and attention paid to each stitch in these complete dolls’ ensembles are universes away from the unremarkable synthetic fabrics and styles of Bratz and contemporary Barbie dolls. We are expected to ooh and ahh, and the museum guests in the gallery when I visited were beside themselves with enchantment—adults gesturing to one another excitedly, commenting on how cute or gorgeous the fabrics were, and mentioning that their grandmothers or great-grandmothers had had similar clothing. 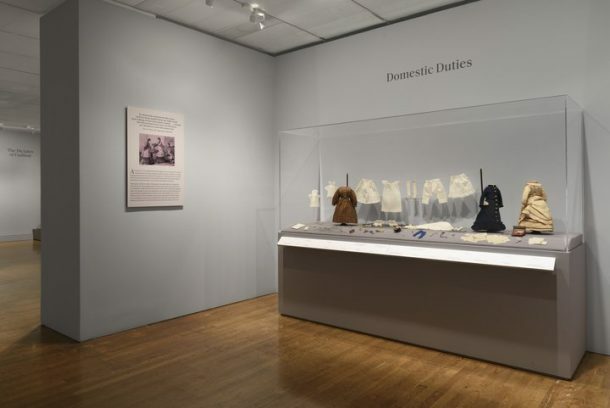 The show itself opens with several women’s dresses from the museum’s collection, seemingly placing the theme of Victorian women’s fashions, and the different situations they corresponded to, at the forefront thematically. 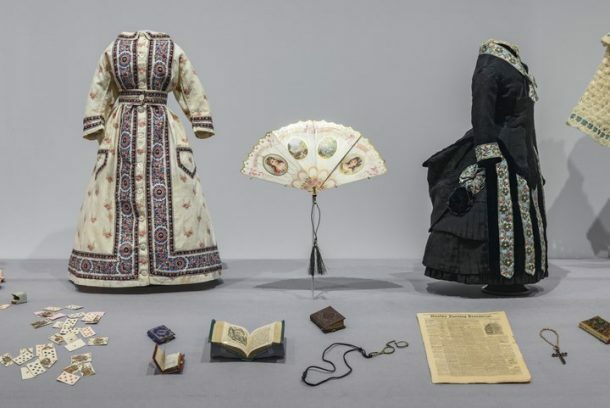 The women’s clothes are accompanied by accessories, such as books on decorum and opera glasses, to help create a fuller picture of the kinds of accoutrements associated with this clothing. The last “real” item of clothing before we get to the focus on dolls is a little girl’s dress on a mannequin, showing how girls’ clothing was like training wheels for what they would wear as ladies—similar styles, but shorter lengths. The rest of Little Ladies is devoted to the display of dolls’ clothes, organized logically and neatly into alcoves to show groupings of dolls’ outerwear, undergarments, everyday fashions, etc. 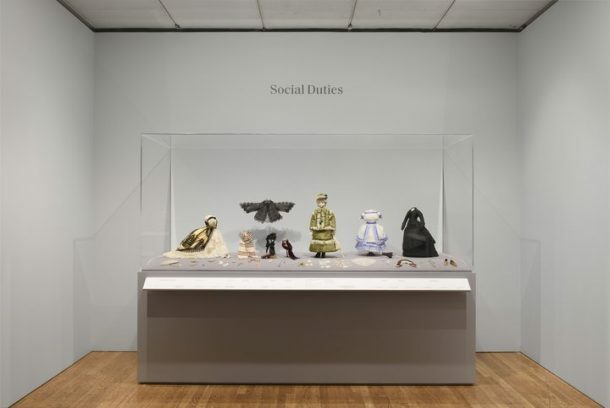 Each cluster of clothes is placed inside a vitrine and neatly labeled, flanked by explanatory text and occasional reproductions of Victorian illustrations to show what these women looked like in contemporary visualizations. (And perhaps it’s just because I loved playing with porcelain dolls as a child, but I didn’t feel in the least unnerved by the presence of these dolls with their unblinking eyes and vacant expressions. Your mileage may vary). However, Little Ladies itself begins to digress thematically as you move through the space, leading to a sense of diminished returns. The impression left is that Little Ladies is a combination of, or even a compromise among, various ideas for displays and presentations that deal with different aspects of women’s lives during the Victorian era. It’s almost as if the dolls’ clothes themselves cease to be objects of study or focus in their own right, instead functioning as miniaturized examples of women’s fashions. The language in the wall texts slips from tying in the idea of dolls having wardrobes that match all situations that adult ladies could expect during their lifetimes—from dressing gowns to ensembles for social calls to mourning fashions—to slowly becoming more and more interested in explaining women’s fashions rather than the purpose of these dolls that are ostensibly the core of the show. For example, the section on fashions for grieving women displays a lovely dolls’ mourning black outfit, while using the wall text to talk about the rules of mourning fashion, leaving out any actual discussion of the potential importance of using a doll to teach young girls about dealing with death. The time period is post-Civil War, meaning that the young girls who grew up playing with these dolls could have experienced the death of a male relative. Did girls learn to dress dolls as widows to help sublimate their grief, and to prepare themselves for the potential loss of a husband when they grew up? Little Ladies doesn’t seem particularly interested in teasing that out, or in presenting a deeper meaning of the emotional roles these dolls could play for the girls who owned them. There’s also a homogenization of the different fashions at play that doesn’t seem to jibe with the historical and practical realities of different regions of the United States. I’m certainly not a fashion historian, but you’d think there’d be at least a few differences in what kinds of clothing women wore in New England versus Virginia versus territories out west due to climate alone. But there’s not any mention of whether these dolls would have reflected localized approaches to dress. Of course, as the show notes, the dolls did hail from Europe, so perhaps their wardrobes reflect English Victorian fashions, and perhaps English Victorian and American Victorian fashions and codes were exactly alike, meaning that the girls who played with these dolls, regardless of whether they grew up in the States or in Britain, received the same cultural educations. 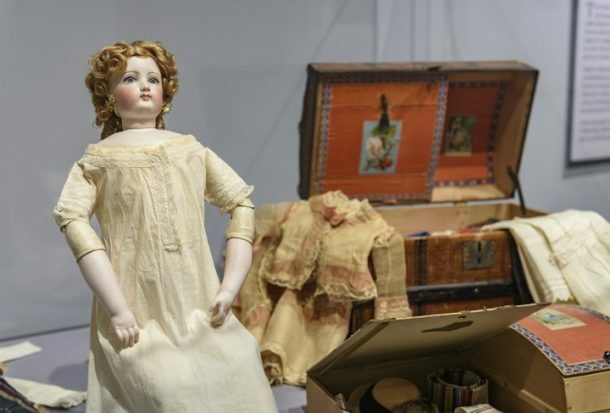 But that aspect of the show—the display of European-manufactured dolls with British Victorian wardrobes that were used to prepare American Victorian girls to join society—frankly confused me. My last big question when I visited Little Ladies was that of social class: the statuses of the girls who owned these exquisite, likely expensive dolls, and of the kinds of labor the show claims these dolls helped prepare girls for. While wall text in the exhibition claims that proper education for young ladies included knowing how to do housework and run a household, there is no mention of the fact that the girls who owned these dolls would likely have employed servants to do tasks like cooking, cleaning, sewing, and laundry when they became the ladies of their own houses. In that case, would these dolls be preparing girls not to actually do the labor themselves, but how to supervise their future servants and maids in these tasks? Or were these dolls simply not as luxurious as they seem to twenty-first century eyes, meaning that the girls who grew up to be maids would have received an education from them that directly pertained to their future? There’s simply no discussion of what social and economic class of girls in Victorian America were being taught a particular kind of lesson: to know how to do household work for their own futures, or because they would be in charge of the people who had to do it? I realize that these critiques are probably quite a lot to ask for a show that isn’t meant to be a blockbuster or mold-breaking Critique of Accepted Histories. But overall, I would have wanted to see Little Ladies to go a little beyond examining Victorian women’s societal roles through doll fashion. Indeed, Little Ladies only envisions one kind of Victorian woman/girl, meaning that the subsequent roles that can be discussed are limited and extremely generalized. When I prepared to visit Little Ladies, I had initially expected that there would be an acknowledgement of the ethnic cultural shifts that took place during the Victorian era, either due to colonization of countries like India by the British, or the emergence of the American “melting pot” through increased immigration. It seems as though creating dolls’ clothing inspired by traditional garb of non-English or American cultures would have provided an opportunity to teach young girls about other nations, but all of the dolls’ clothing on display is firmly within the British-American classical “Victorian” style. What does it mean for a museum in 2018 to make this show filled with beautiful objects (and some attempts at social relevance) without addressing class, social status, or colonialism in the Victorian era? It’s not as if these subjects are too hard for children to understand; Samantha, my favorite American Girl doll, notably takes a stand against the disastrous conditions of child factory workers in Victorian America, in Samantha Learns a Lesson, which I read when I was seven or eight. The commendable last room in the gallery space does ask questions about how portrayals of, and expectations for, women has changed, even displaying one of the aforementioned mass-produced Barbie dolls. But a simple nod to the problems of beauty standards, frankly, isn’t quite enough. When a show is allowed to be as hyper-focused as Little Ladies, it seems a shame that there’s not an equally rigorous thematic exploration. Deborah Krieger is the curatorial assistant as the the Delaware Art Museum and an arts and culture writer based in Philadelphia. She has written for BUST Magazine, Whitehot Magazine of Contemporary Art, the Philly Artblog, the Humble Arts Foundation, the LA Review of Books, and more. She can be found on her website http://www.i-on-the-arts.com/ and on Twitter and Instagram @debonthearts. Tags: dolls, Fashion, Little Ladies: Victorian Fashion Dolls and the Feminine Ideal, Philadelphia Museum of Art, Victorian dolls. Bookmark the permalink.